Tight on Space? Check out these Low-Maintenance Landscaping Ideas! Without much time or energy to invest in a demanding backyard or front lawn, some homeowners become discouraged. They stop mowing their grass, stop weeding, and stop enjoying their own yards. When you lack much space outdoors, it’s even easier to shrug off landscaping. However, with a few clever landscaping tricks, you can enjoy a beautiful and impressive yard without shoveling all your time into maintenance. Some plants will die in a matter of days without careful attention, but others can survive year after year with irregular watering and trimming. The local climate determines which plants and flowers will have the best chances of surviving long-term. Native plants usually require less work than exotic species. Because they’re built to survive in your climate, they’ll be easier to take care of than foreign plants. Potted plants and flowers tend to be more easily managed than flower beds. Best of all, you can rotate and rearrange potted plants to add variety year-round without having to kneel in the dirt for hours every month. Perennial flowers often satisfy the needs of homeowners looking for attractive but low-maintenance landscaping. Easy-care shrubs and hedges require even less attention when chosen strategically. Especially in a small backyard, fast-growing grass can be a pain to manage. The more you fill that space with ferns, rocks, wood chips, and flower beds, the less grass you’ll need to mow. Line the edges of your yard with flowers and bushes to give the garden a natural look, and fill the center of the yard with a wide walkway or a platform perfect for meditation. Incorporate a bird bath or stone fountain in a corner. If you cannot avoid large areas of grass, try to fill your yard with a slow-growing grass. Some types have been bred to require only a few mowings a year! Incorporate “hardscaping” into your landscaping. Fill your flower beds with crushed stone—you’ll never need to replace it. Edge your landscaping with stone, and it’s unlikely to move. If you’re interested in a walkway through your backyard, but you’re uninterested in extensive construction, a gravel pathway filled with stone pavers and edged with fist-sized rocks can make an impression without requiring regular attention. Stone can meet many needs in your yard—you just need to think creatively! If you aren’t interested in filling your flower beds with stone, mulch is another option. An aromatic mulch bed only needs to be replaced once a year. It requires no mowing or watering, helps to fertilize plants, and hinders the growth of weeds in your flower beds. Before filling your garden with mulch, make sure to clean out the weeds and rake the dirt until it’s smooth. A little work in advance of putting down the mulch will make your flower beds easier to maintain long-term. Wood rots without proper sealing, and it usually requires regular painting. For any physical structures in your yard, choose more durable materials that are better suited to constant exposure. As previously mentioned, stone works well as a substitute. Instead of a thin, wooden lattice, erect a steel arbor or trellis. 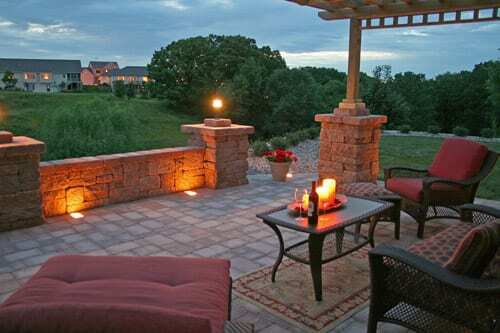 A backyard is an ideal sanctuary for relaxation. To spend more time lounging in a hammock and less time maneuvering a lawnmower around tight corners, it’s important to plan your landscaping around your space, your availability, and your budget. If you put some work into your yard on the front end, you’ll have more time to enjoy it once the landscaping is installed. Assess the current landscape and invest early in tools to reduce watering, mowing, weeding, and other regular chores. Constructing a deck or a patio may seem more costly to start, but you’ll save yourself the trouble of fighting a never ending battle with fast-growing grass.